The roof on your home is designed to last for years and even decades depending on the type of roofing that is installed. But when it comes time to replace your roof making sure you get the most out of your roofing project is a must. 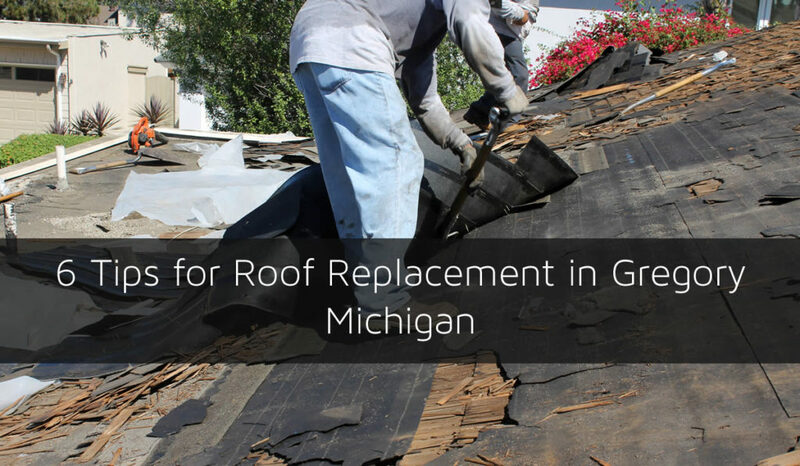 Here at Livingston Roof Pros we can install a new roof in Gregory Michigan if needed but we wanted to first share some tips on roof replacement in Gregory Michigan and give you some tips to save you time and money and make sure you get the best roofing installation for your money. Even if you decide to use another roofing contractor in Gregory Michigan these tips can certainly help. The tips for getting a new roof below are for home owners that are considering getting a new roof installed. If you don’t know if you need a new roof or just roof repair in Gregory Michigan be sure to give us a call for a roof inspection on your home to determine what shape your roof is in. We’ll also provide you with a report of our findings to better help you decide if you need a new roof or not. 1 – Should You Re-Roof or Use Tear Off Method? You can save money by using a re-roof where new asphalt shingles are applied directly on top of the old roof. This can help with pricing as it’s much less labor intensive and there is far less debris to be removed after the project is complete. However, there are some drawbacks to using this method. Re-roofing doesn’t allow the roofing contractor to fully inspect the roof decking which may have problems. A better, but more expensive way, is to fully remove the old roof by the tear off method which means all the old shingles are removed exposing any problems in the roof decking. Changing the roofing material on your home can have undesired effects. Changing from metal roofing to shingle roofing or vise versa may mean you’ll need to install additional items on the roof which can drive the cost up. Be sure to get an estimate if you plan on changing the roofing materials on your home. At Livingston Roof Pros we are fully qualified and licensed roofing contractor in Gregory Michigan. Make sure you always use a licensed and certified roofing contractor on your roof when getting a new roof installed or even roof repairs. Incorrect installation can void all manufacturers warranties on the roofing materials and you may be forced to reinstall the roof because of this later. Always use certified installers and contractors on your home’s roof. There are warranties that are usually attached to roofing materials by manufacturers. Those warranties can last 10 years to more than 50 years. Always inquire about the warranties that will be included with the roofing materials that you have installed on your home. It’s best to get these warranties in writing as well and keep them in a safe place. Some roofing contractors in Gregory Michigan will also give you a labor warranty as well on the roofing project. Getting a roofing estimate on the project can help you better compare pricing and materials from different roofing contractors. Here at Livingston Roof Pros we offer free roofing estimates on roof replacement or roof repair. Simply give us a call to learn more and get your free roof estimate in Gregory Michigan. Most licensed and certified roofing contractors will want you to sign a contract before the project begins. This contract not only protects the roofing contractor but it also protects you the home owner. Read over the contract and ask questions if you need clarification on any items. This contract usually states what work will be done, when it will be done, and how much it will cost. While working with someone with a handshake may seem like a novel idea it’s also very risky for both parties. Always use a contractor that has a contract with you. Ready to get started on your roofing project? Give Livingston Roof Pros a call today at 517-940-8770 for more information and to get a free roofing estimate today.